No Cover Charge, TWO DRINK Minimum (can be non-alcoholic) Every Friday at least TWO different comedians and YOU CAN DO COMEDY TOO! Karaoke and Open Mic Music starts at 9 and continues after the Comedy. 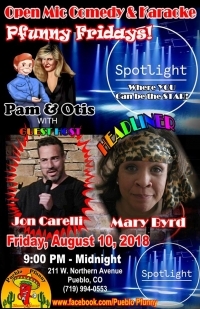 Comedy starts around 9:45 (sign up between 9:20 and 9:40 to perform). 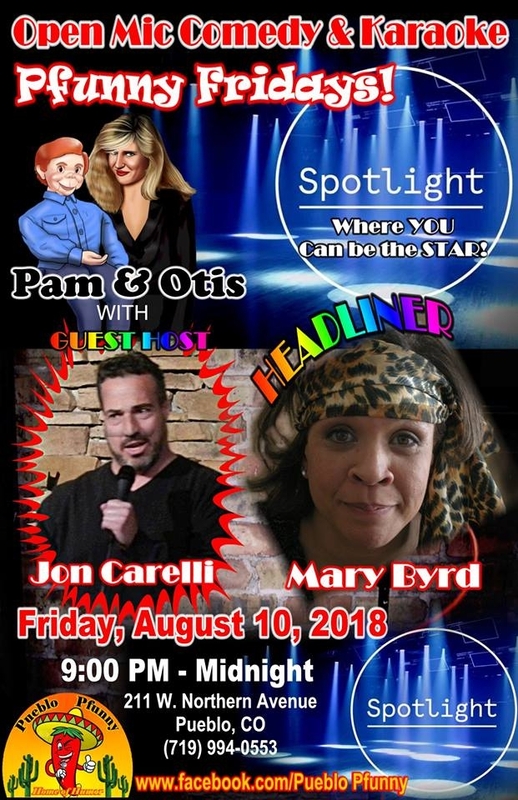 Your Host:Jon Carelli (Colorado Springs) Your Headliner: Mary Byrd (Albuquerque, NM). The Spotlight Bar 211 W. Northern Ave (look for our banner on the wall next door to Northern Liquors, 2 doors down from Myxed Up). Additional parking across the street in the parking lot. Every Friday at least TWO DIFFERENT Comedians.